Charles Méryon (November 23, 1821-February 13, 1868), was a French artist, who worked almost entirely in etching, as he suffered from colour-blindness. Although now little-known in the English-speaking world, he is generally recognised as the most significant etcher of 19th century France. He also suffered from mental illness, dying in an asylum. His most famous work is a series of views of Paris, known as Eauxfortes sur Paris. Also much cited individual prints are his Le Ministère de la Marine and the Stryge. He was born in Paris, his father being an English physician and his mother a French dancer. Méryon's mother brought him up, but died when he was still young, and Méryon entered the French navy, and in the corvette "Le Rhin" made the voyage round the world. He was already a draughtsman, for on the coast of New Zealand he made pencil drawings which he was able to employ, years afterwards, as studies for etchings of the landscape of those regions. The artistic instinct developed, and, while he was yet a lieutenant; Méryon left the navy. Finding that he was colour blind, he determined to devote himself to etching. He entered the work room of one Bléry, from whom he learnt something of technical matters, and to whom he always remained grateful. Méryon had no money, and was too proud to ask help from his family. He was forced to earn a crust by doing work that was mechanical and irksome. Among learners' work, done for his own advantage, are to be counted some studies after the Dutch etchers such as Zeeman and Adriaen van de Velde. 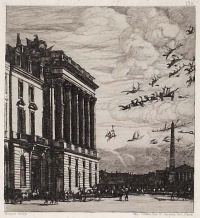 Having proved himself a skilled copyist, he began doing original work, notably a series of etchings which are the greatest embodiments of his greatest conceptions--the series called "Eaux-fortes sur Paris." These plates, executed from 1850 to 1854, are never found as a set and were never expressly published as such, but they nonetheless constituted in Méryon's mind an harmonious series. 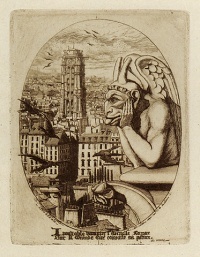 Besides the twenty-two etchings "sur Paris", Méryon did seventy-two etchings of one sort and another ninety-four in all being catalogued in Frederick Wedmore's Méryon and Méryon's Paris; but these include the works of his apprenticeship and of his decline, adroit copies in which his best success was in the sinking of his own individuality, and more or less dull portraits. Yet among the seventy-two prints outside his professed series there are at least a dozen famous ones. Three or four beautiful etchings of Paris do not belong to the series at all. Two or three others are devoted to the illustration of Bourges, a city in which the old wooden houses were as attractive to him for their own sakes as were the stonebuilt monuments of Paris. Generally it was when Paris engaged him that he succeeded the most. He would have done more work if the material difficulties of his life had not pressed upon him and shortened his days. He was a bachelor, yet almost as constantly occupied with love as with work. The depth of his imagination and the surprising mastery which he achieved almost from the beginning in the technicalities of his craft were appreciated only by a few artists, critics and connoisseurs, and he could not sell his etchings or could sell them only for about lod. apiece. Disappointment told upon him, and, frugal as was his way of life, poverty must have affected him. He became subject to hallucinations. Enemies, he said, waited for him at the corners of the streets; his few friends robbed him or owed him that which they would never pay. A few years after the completion of his Paris series he was placed in the asylum at Charenton. Briefly restored to health, he came out and did a little more work, but at bottom he was exhausted. In 1867 he returned to his asylum, and died there in 1868. In middle age, just before he was confined, he associated with Felix Bracquemond and Leopold Flameng, skilled practitioners of etching. The best portrait we have of him is one by Bracquemond under which the sitter wrote that it represented “the sombre Méryon with the grotesque visage." There are twenty-two pieces in the Eaux-fortes sur Paris. Some of them are insignificant. That is because ten out of the twenty-two were destined as headpiece, tailpiece, or running commentary on some more important plate. But each has its value, and certain of the smaller pieces throw great light on the aim of the entire set. Thus, one little plate--not a picture at all--is devoted to the record of verses made by Méryon, the purpose of which is to lament the life of Paris. Méryon aimed to illustrate its misery and poverty, as well as its splendour. His etchings are no mere views of Paris. They are “views" only so far as is compatible with their being likewise the visions of a poet and the compositions of an artist. Méryon's epic work was coloured strongly by his personal sentiment, and affected here and there by current events — in more than one case, for instance, he hurried with particular affection to etch his impression of some old-world building which was on the point of destruction. Nearly every etching in the series reveals technical skill, but even the technical skill is exercised most happily in those etchings which have the advantage of impressive subjects, and which the collector willingly cherishes for their mysterious suggestiveness or for their pure beauty. The Abside de Notre Dame is the general favourite and is commonly held to be Méryon's masterpiece. Light and shade play wonderfully over the great fabric of the church, seen over the spaces of the river. As a draughtsman of architecture, Méryon was complete; his sympathy with its various styles was broad, and his work on its various styles unbiased and of equal perfection--a point in which it is curious to contrast him with J.M.W. Turner, who, in drawing Gothic architecture, often drew it with want of appreciation. It is evident that architecture must enter largely into any representation of a city, however much such representation may be a vision, and however little a chronicle. Even the architectural portion of Méryon's labour is only indirectly imaginative; to the imagination he has given freer play in his dealings with the figure, whether the people of the street or of the river or the people who, when he is most frankly or even wildly symbolical, crowd the sky. Generally speaking, his figures are, as regards draughtsmanship, “landscape-painter's figures." They are drawn more with an eye to grace than to academic correctness. But they are not “landscape-painter's figures" at all when what we are ‘concerned with is not the method of their representation but the purpose of their introduction. They are seen then to be in exceptional accord with the sentiment of the scene. Sometimes, as in the case of La Morgue, it is they who tell the story of the picture. Sometimes, as in the case of La Rue des Mauvais Garçons--with the two passing women bent together in secret converse--they at least suggest it. And sometimes, as in L'Arche du Pont Notre Dame, it is their expressive gesture and eager action that give vitality and animation to the scene. Dealing perfectly with architecture, and perfectly, as far as ‘concerned his peculiar purpose, with humanity in his art, Méryon was little called upon by the character of his subjects to deal with Nature. He drew trees but badly, never representing foliage happily, either in detail or in mass. But to render the characteristics of the city, it was necessary that he should know how to portray a certain kind of water—river-water, mostly sluggish--and a certain kind of sky--the grey obscured and lower sky that broods over a world of roof and chimney. This water and this sky Méryon is thoroughly master of; he notes with observant affection their changes in all lights. Méryon's excellent draughtsmanship, and his keen appreciation of light, shade and tone, were, of course, helps to his becoming a great etcher. But a living authority, himself an eminer~t etcher, and admiring Méryon thoroughly, has called Méryon by preference a great original engraver--so little of Méryon's work accords with Sir Seymour Haden's view of etching. Méryon was anything but a brilliant sketcher; and, if an artist's success in etching is to be gauged chiefly by the rapidity with which he records an impression, Méryon's success was not great. There can be no doubt that his work was laborious and deliberate, instead of swift and impulsive, and that of some other virtues of the etcher--"selection" and "abstraction" as Hamerton has defined them--he shows small trace. But a genius like Méryon is a law unto himself, or rather in his practice of his art he makes the laws by which that art and he are to be judged. It is worthwhile to note the extraordinary enhancement in the value of Méryon's prints. Probably of no other artist of genius, not even of Whistler, could there be cited within the same period a rise in prices of at all the same proportion. Thus the first state of the "Stryge" - that "with the verses" - selling under the hammer in 1873 for £5, sold again under the hammer in 1905 for £100. The first state of the "Galérie de Notre Dame" - selling in 1873 for £5 and at M. Wasset's sale in 1880 for Lii, fetched in 1905, £52. A "Tour de l'horloge," which two or three years after it was first issued sold for half a crown, in May 1903 fetched f70. A first state (Wedmore's, not of course M. Delteil's "first state," which, like nearly all his first states, is in fact a trial proof) of the "Saint Etienne du mont," realizing about £2 at M. Burty's sale in 1876, realized £60 at a sale in May 1906. The second state of the "Morgue" (Wedmore) sold in 1905 for £65; and Wedmore's second of the "Abside," which used to sell throughout the seventies for £4 or £5, reached in November 1906 more than £200. At no period have even Dürers or Rembrandts risen so swiftly and steadily. Unless indicated otherwise, the text in this article is either based on Wikipedia article "Charles Méryon" or another language Wikipedia page thereof used under the terms of the GNU Free Documentation License; or on original research by Jahsonic and friends. See Art and Popular Culture's copyright notice. This page was last modified 06:12, 3 July 2014.